I make a break for a space that's just opened up on the top lane approaching the flyover. 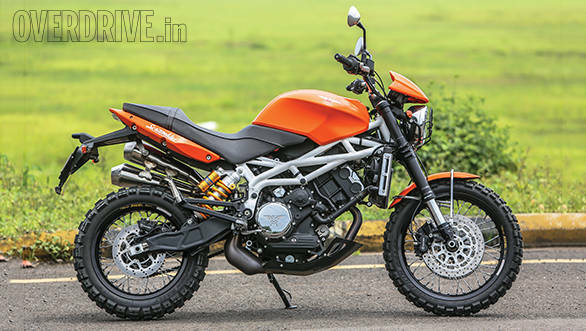 The orange Scrambler explodes forward like the rocket propelled grenade it really is. The transition from 60kmph to 120kmph happens so fast, I've no time to catch it, no time to prevent it. I don't know what gear I'm in and I am only beginning to understand this special brand of Moto Morini madness. The name goes way back but the Scrambler's story starts with the Bialbero CorsaCorta, a long name for a very special engine that now powers every single one of these Italian bikes. 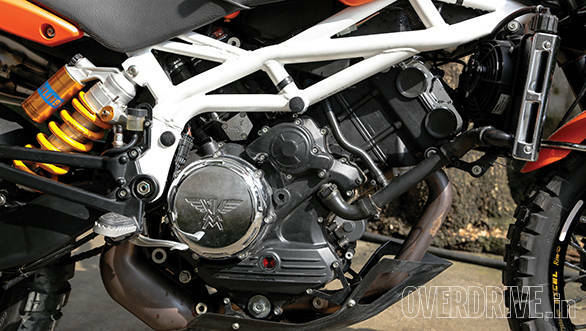 The 1187cc engine has four valves for each of its cylinders. The two cylinders are mounted in an 87 degree vee that fills the hydroformed chassis completely. 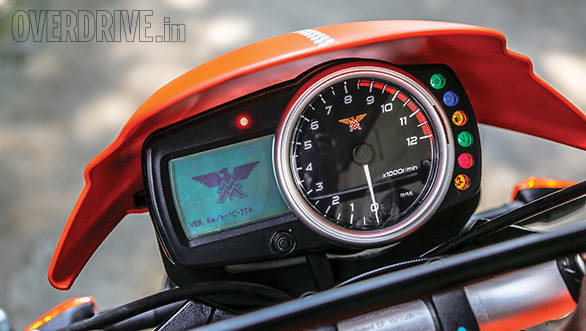 More importantly, in the Scrambler's state of tune, it gives the bike 117PS at 8,500rpm and 105Nm at 7,000rpm. 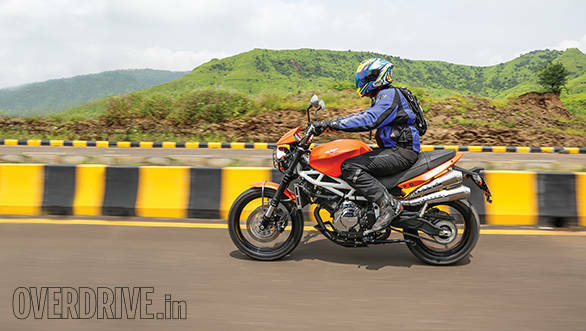 On a motorcycle geared for 200kmph, this means the flow of torque has no beginning and no end. It's just there. All the time. Which brings us back to the madness. The first thing you notice is, when you're pushing this 'dirtbike' around for the shoot that it's heavy. Yes, 200kg with everything but fuel isn't exactly size zero. Then you notice that the top edge of the tank is roughly the same height as my sternum. Oh my. On the bike, there's a bit of tippi-toes before you settle in. Then the fear grips you. Because this may have new technology like a slipper clutch and all, but this is an old school bike - it has an engine, a frame, a seat, suspension, wheels, tyres, bars and brakes. There are no electronics waiting to turn defeat into heroic riding. Not even ABS. There's an oddly musky appeal to the motorcycle which makes all the testosterone in your system feel alive. 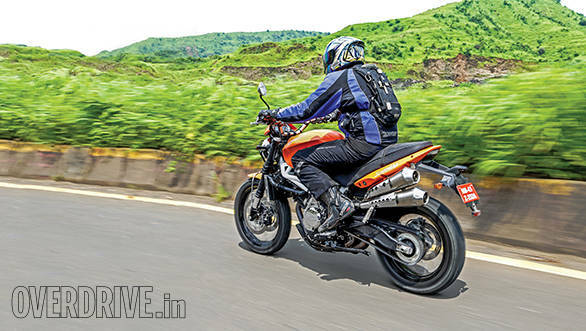 If you think of yourself as a sort of Wolverine-type person - all bulgy muscles, self-reliance and one-liners delivered through clenched teeth, this is the motorcycle you should be riding. I'll tell you why. Later on, I find an empty road and wind the throttle to the stop almost squinting in anticipation of what is about to happen. The engine goes absolutely berserk. The exhaust isn't particularly subtle. But with the throttle opened suddenly the induction roar is intense and lovely in a very masculine, raw sort of way. You'll want to hear more of it, I guarantee. 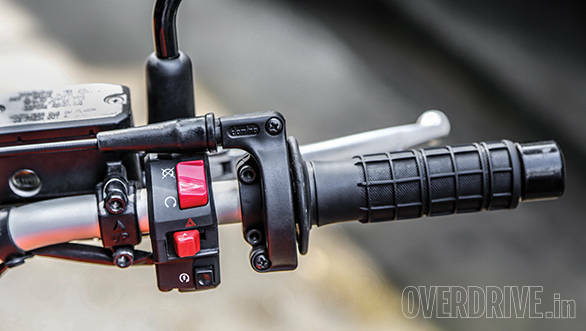 The connection from the throttle to thrust is immediate, instant and transparent. It's so sensitive that if you flex your forearm you can usually produce an attendant change of speed. On our less than perfect roads, there is the real danger that you'll arm pump yourself just trying to hold a steady speed. But when you wind it on, the Scrambler is electric. It doesn't accelerate as much as it tries to reappear much farther down the road in an instant suddenly going a 100kmph faster. All these fun and games are scary and titillating until you feel the motorcycle going into a steady weave around 160kmph. There's a lot of stuff that's funny at 160kmph. But a chassis weave isn't. Later you'll realise that the weave is probably coming from the simple fact that we are riding a bike with the standard knobby tyres. The optional street tyres are actually rated for the bike's top speed while these knobbies aren't. The weave, perhaps, the Scrambler's gentle way of telling you that you're in over your head. I try this again and again and the weave sets in at 140, 150 or therebouts depending on the state of the road. But it never really becomes scary and I started using that as a limit to see how fast the road is. Then I come upon a lovely sweeping left that goes on forever. And I find that on the throttle in the corner, the Scrambler is responsive, stable and able to work that knobby very hard even on tarmac. Hey, I'm beginning to enjoy this. The spurt of affection allows me to gloss over the indifferent switchgear quality as well as the generic instrument cluster that I think can stand a little more detail work. It certainly doesn't match up to the other equipment on offer. There's Marzoc- chi forks up front, Paioli makes the standard rear shock while our test bike comes with optional, adjustable Ohlins. Brembo for the brakes, Excel for the rims - there's nothing left to chance. But as soon as the traffic thins, you forget these niggles. Because the Scrambler rewards an opening throttle with a massive slug of torque that'll straighten your arms, waggle the bars and broaden the incipient grin into a full on laugh. In our age of sanitised, censored everything, the Scrambler is an uncut adult movie in a world full of edited PG-13s. It hides nothing, it makes no attempt to protect you from yourself. 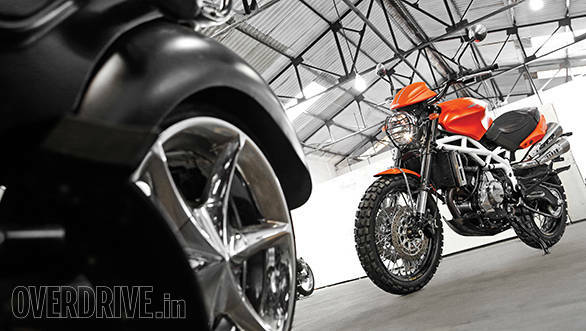 It gives you a hair-trigger throttle, sharp brakes, capable chassis and asks you to make your own way. You'll wonder if you can live with a motorcycle with reflexes this sharp without getting tired of the hyperactivity. You'll wonder if you shouldn't have settled for something less mad. But then you'll see a space open up and wind it on. And pass through the gap with the bars rocking, aghast and thrilled at the mixture of acceleration, exhilaration and fear that drives you on and on. This is not a cocktail you see often on today's motorcycles and I think that defines the Moto Morini. The Scrambler is the anti-establishment machine. It's a brand that in India doesn't have significant cachet. It's extremely expensive and therefore it will be extremely rare too. If you don't want a motorcycle just like the one everyone else has, an experience of the sort that's almost impossible to get today, look no further. Just remember you'll probably need to work out before you go for a grapple with the Scrambler.